Scholarships are awards of money that can help students fund a college education. Scholarships typically do not have to be paid back, though students may have to meet certain expectations or commitments to maintain a scholarship. Scholarships are awarded based on specific criteria set by the provider (e.g. merit-based, need-based, athletic or artistic talent, affiliation with a certain group, etc.) Listed below are local, state, and national scholarships that have been promoted to the EHS counselors. Keep in mind that there are MANY more scholarships out there! Check for scholarships where you bank, where you work (or where your parents work), at your place of worship, etc. See your counselor if you have any questions about scholarships! Remember, you should NEVER pay to apply for a scholarship. If it asks for a payment, it's probably a scam! See links below under "Scholarship Databases & Resources" for even more scholarship opportunities! The Injured Workers Law Firm has decided to offer a $5,000 trade school scholarship. The scholarship is available to Virginia residents who have been accepted to an accredited vocational or trade school, and who meet the qualifications as described below. A full list of the scholarship eligibility requirements is can be found here. This application is open to college freshman, sophomore and juniors who are 2016, 2017 and 2018 graduates of Essex County High School in Tappahannock, VA. Students must have graduated with at least a 3.0 GPA, have a financial need, majoring in Art, Education, Business, History, STEM or related-major, and attending an UNCF member institution or an HBCU. - Submit most recent unofficial or official transcript. The Three Rivers SWCD scholarship program promotes the education of students in technical fields with a natural resource conservation and environmental protection emphasis. The program provides financial support to students with an agriculture background or majoring in or showing a strong desire to major in a course curriculum related to natural resource conservation and/or environmental studies. Eligibility: Individual applicants must be full time students and residents of King William, Essex, or King and Queen Counties who have applied to a college freshman level curriculum or pursuing an undergraduate or graduate level degree in a course curriculum related to natural resource conservation or environmental studies. 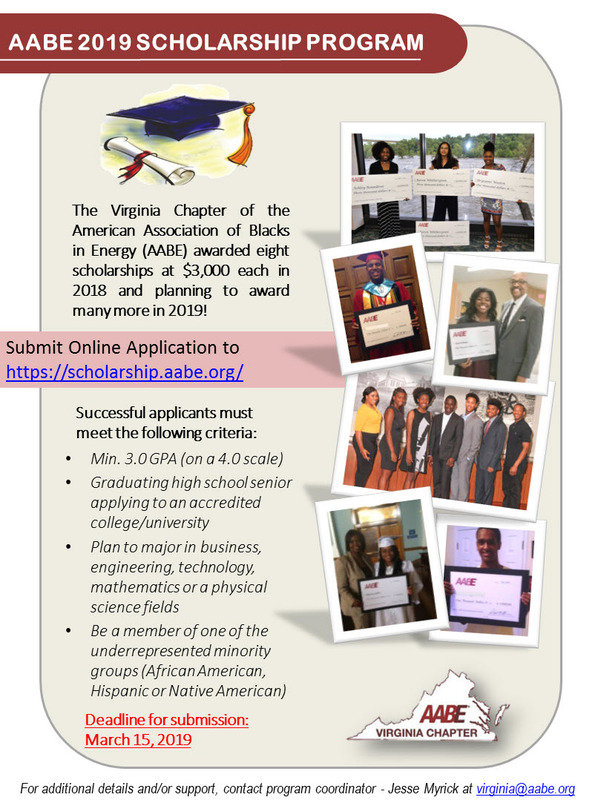 The Virginia Chapter of AABE 2019 Scholarship program is currently accepting applications for high school seniors planning to major in a Science, Technology, Engineering, or Mathematical (STEM) field through an accredited college or university. Due to successful fundraising, AABE have increased the number of scholarships and college stipends planned for 2019. Eligibility: Please visit the “Student Relations” section on our chapter-website for specific details and requirements. A flyer is also attached for your convenience. Click here for the flyer. The 2019 GRASP Last Dollar Scholarship is now available! At least one student from each high school with a GRASP advisor will be awarded a $500 scholarship. Additional scholarships may range from $250 to $4,000. - Met with the high school GRASP advisor during his or her senior year. - Possess at least a 2.0 cumulative grade point average. - Will graduate from high school spring of 2019.
will be requested before the scholarship is granted.). - Will attend a post-secondary school in Virginia (public or private). Where to apply: Paper copies are available outside the School Counseling offices. Click here to download the application. GRASP will award scholarships to selected applicants in the amount of $1,000 for their first year of community college. Scholarships may be renewed for a second year of the recipients' program. Eligible scholarship recipients will enroll at a Virginia Community College to either complete a career certificate or with the intent to transfer to a Virginia four-year public or private institution through a Virginia Guaranteed Admission Agreement. Where to apply: Paper copies are available outside School Counseling offices. Click here to download the application. The Community Foundation 2019 scholarship program for graduating high school seniors, recent high school graduates and adult learners is now available. There are more than 65 different scholarship opportunities. Eligibility criteria, which is unique to each scholarship, and application information can be accessed on the Foundation’s website: https://www.cfrichmond.org/Apply-for-a-Scholarship/View-All-Scholarships. All applications and supporting materials must be submitted online and are due to the Foundation on or before March 7, 2019 at 5:00 pm. Please request transcripts and letters of recommendation well in advance of the deadline as the Community Foundation will not be able to offer deadline extensions due to inclement weather. pursuing an aviation related career at an accredited institution. The scholarship will be paid directly to the institution in the name of the awardee. The deadline for 2019 submissions is Friday, April 12, 2019. Eligibility: Student must be a high school senior with at least a 3.0 GPA, and Proof of acceptance into an aviation-related post-secondary education program. Full Eligibility Requirements. Where to apply: Students can find the scholarship outside of the school counseling offices, or click here to download. The purpose of this scholarship is to give a High School senior who is seeking a business or financial related degree at an accredited college or university an additional monetary opportunity to further their education. This scholarship is worth $1000, and is due March 1, 2019. Eligibility: Any high school senior who is planning to pursue a degree in business or financial related field from an accredited college or university. Where to apply: Click here to download the application. Applications are also found outside the school counseling offices. Check back to this page throughout the year for Scholarship updates. Most Scholarship opportunities will be posted in the Spring, however there will be a few in the fall.